Out for a nice Sunday joyride. 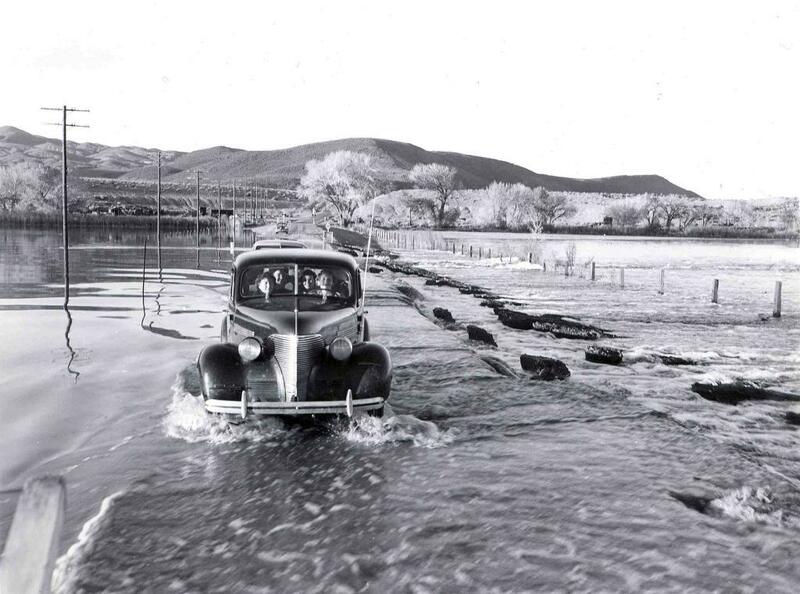 This photo of a car full of folks comes from 1950, when there was massive flooding along the Eastern Slope of the Sierra. The fields are completely inundated, and only the line of telephone poles marks where the road is and keeps them from driving into a watery ditch. Nevada does not get a lot of precipitation, but every once in a while a major storm comes barreling over the mountains and takes everyone by surprise. The Flood of 1997 is still in recent memory of many people around here, where several feet of snow fell in the mountains and then immediately were melted by a warm rain. 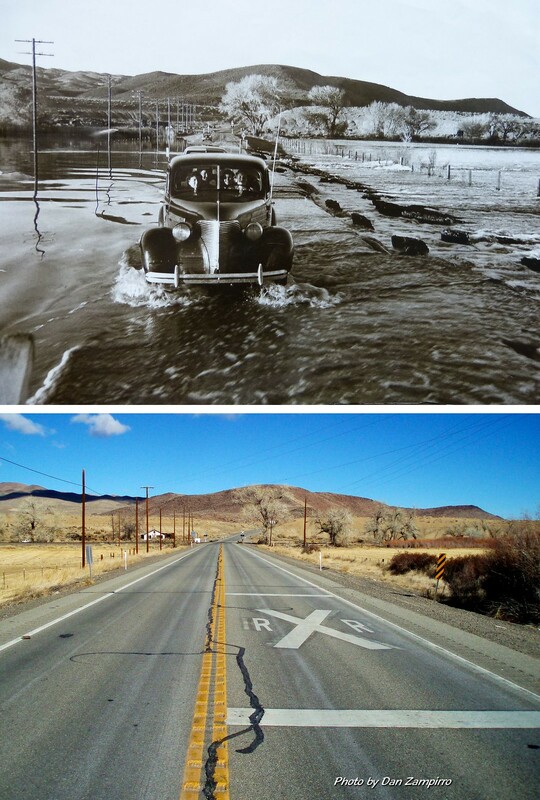 The resulting deluge overflowed rivers all over Northern Nevada and wiped out roads and bridges in every town. But that was not the first mega flood. Mother Nature has a way of reminding us humans who really holds all the power. Back as far as 1861, floods nearly washed away the few people hardy enough to have settled in the area. Again in 1867 a flood rushed down from the mountains that destroyed every bridge in the Eagle and Carson Valleys. A flood in 1955 buried much of downtown Reno under a wall of water, and flooding in 1986 turned the grassy valleys into tranquil lakes. But the Flood of 1950 was perhaps the worst, because it came at a time of huge population growth, but before any kind of flood mitigation had been put in place. What few reservoirs there were in the mountains quickly overflowed. Highways were washed out, bridges collapsed under the push of so much water. One person died and $6 million in damage was done. This flood prompted massive work to be undertaken to improve flood control in the mountains and in the cities, and many reservoirs were built immediately after the flood to contain water up in the mountains rather than let it cascade down into the valleys. The location of this photo used to be a mystery. NDOT has it labelled as a scene from the flooding in Reno, and the landscape looks nondescript enough that it could have been somewhere in an undeveloped part of the Truckee Meadows. Turns out, it’s not Reno at all. Thanks to the eagle-eyed research of Dan Zampirro, we know that this stretch of road is a couple of hours southeast of Reno, right near Fort Churchill. The mountains in the background are a dead giveaway. The road is US Hwy 95 Alt. The water is coming from the Carson River, which has seriously overflowed its banks thanks to the flooding. Right behind the photographer is the Buckland Station, one of the oldest stagecoach stops still left in the state. Off to the left are the adobe ruins of Fort Churchill, the remnants of an Army fort from the Civil War days. 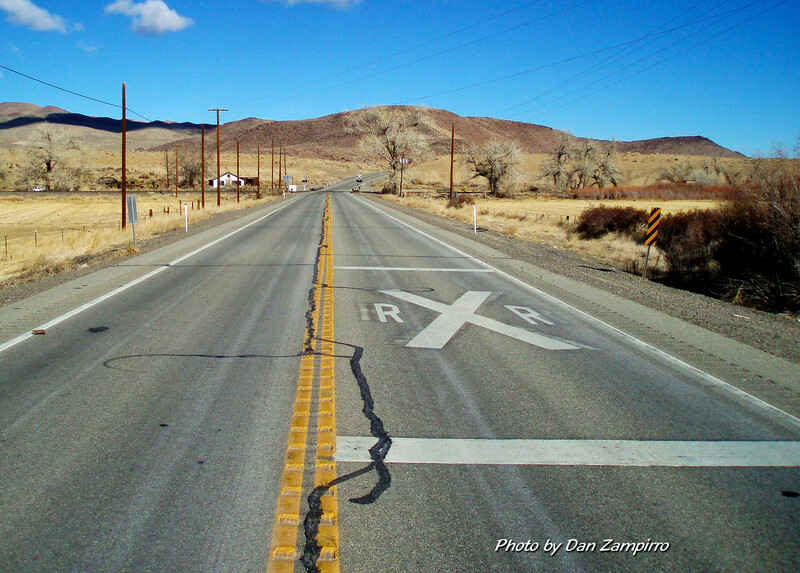 This stretch of road connects Silver Springs to Yerington, and anyone travelling from Carson/Reno to Vegas is likely to have driven through here on the way. Nowadays the land is dry, thanks to several dry winters in a row that have left us on the verge of the dreaded D-word, drought. Precipitation in the Great Basin definitely comes in waves, with several very wet years all clumped together, followed by several dry years. All of the water we use in Carson City and Reno comes from these winter storms, so if we hardly get any storms, we’re in bad shape in the winter. I don’t think we’ll be seeing another large flood like this anytime soon, if our dry patterns hold. This was brought to the attention of Nevada Magazine when they published their 2012 Nevada Historic Calendar – November’s photo. That’s the same road I take whenever I travel to Las VEgas, I remember now….